Marilyn SanClemente February 21, 2018 March 5, 2018 Birthday, Occasions catalog, Stampin' Up! Today I am featuring a set of kids cards that would make a Magical Day birthday party for kids. These cards are stunning and feature a variety of techniques. 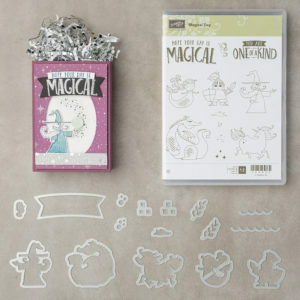 They feature the Magical Day stamp set from the Stampin’ Up! Occasions catalog. Here is a sneak peak of one of the cards. 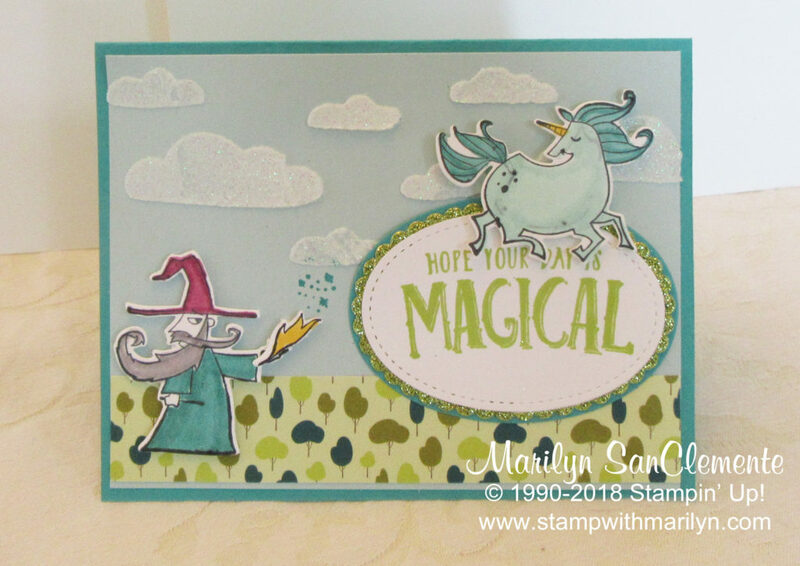 This card features the Wizard and the Unicorn from the Magical Day stamp set. The Clouds in the background of this card are made with the cloud stencil from the Pattern Party decorative masks and the Shimmer White Embossing Paste on a piece of Soft Sky Cardstock. The Wizard and the Unicorn are stamped on Whisper White cardstock and colored with markers. They are then cut out using the coordinating framelit dies. The sentiment “Hope Your Day is Magical” is stamped with Lemon Lime Twist Ink and cut out using the Layering Oval Framelits. This is layered on Scalloped Oval cut from the Lemon Lime Twist Glimmer paper that coordinates with the Myths & Magical Designer paper. The Wizard card is just one of 5 projects that is available with this set. Other cards in this set include a shaker card featuring mermaids, a second is a quilt card featuring a mermaid. 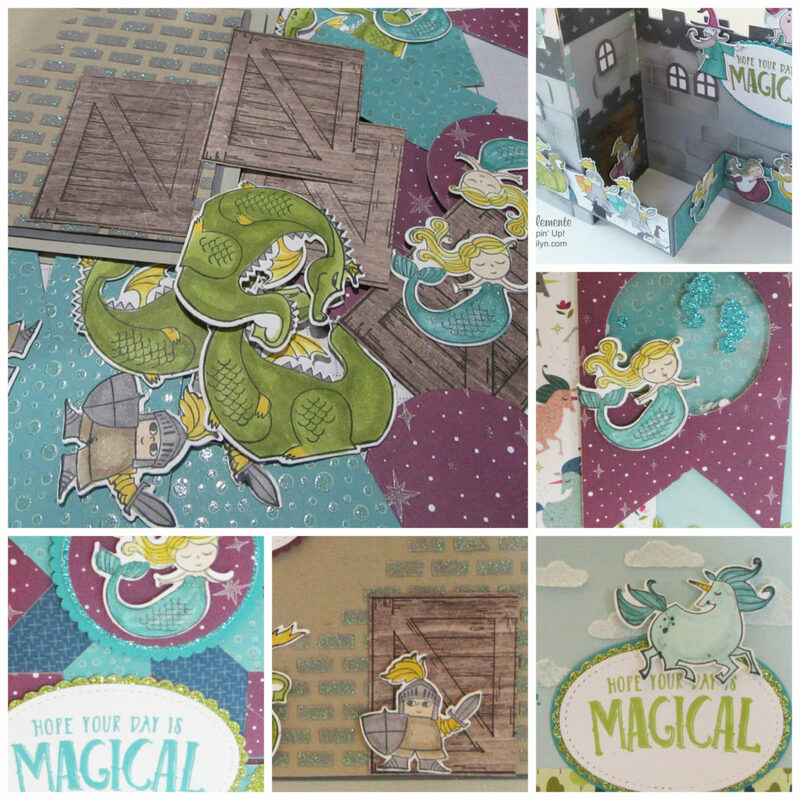 There is a cute card with a dragon attacking a castle. Another card with a wizzard and unicorns. The last is a Z Fold Card decorated as a Castle! This card would be great as a centerpiece for a Kids Birthday Party. I will be teaching a class making these 5 cards on Friday the 23rd at my Creative Playground in Methuen, Massachusetts. Not in MA – I am also assembling instructions and will have the PDF available for sale soon. Stay tuned for the information for the online class! The class will be coming out next week! Have you signed up for my newsletter? Information on this class will be made available next week in my newsletter! So sign up today. You will also receive exclusive papercrafting projects and ideas as well as specials as soon as they are available. I hope you have enjoyed my Wizard card that is part of my Magical Day Birthday Party for Kids Class.